A calm winter morning… a visit to a friend’s house… a series of improvisations on piano… Searching for the limits of the instrument’s sounds and exploring into the silence of the room… Recorded and edited on laptop. One morning, last winter, Yiorgis Sekellariou went to a friends house and recorded some improvisations on the piano onto his laptop. As Mecha/Orga he now presents the result on his second CDR release, following ‘Float’ (see Vital Weekly 466). The fact that the works was recorded onto a laptop is quite important to realize. 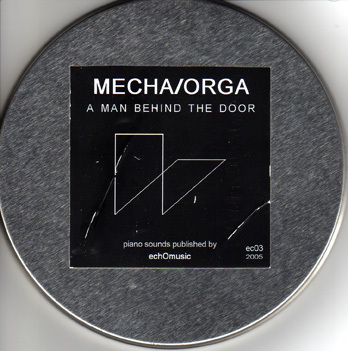 Not a minidisc, a cassette or a DAT machine, but recorded straight into the heart of a machine that can transform the sounds, even when the first couple of pieces on ‘A Man Behind The Door’ sounds like a piano improvisation and nothing much else. But as the release progresses, computer processing starts playing at first a small role and then, gradually, more and more, until it reaches the twelfth track which consists entirely of computer processed piano sounds. Most of the playing is done traditionally on the keys, but also, along similar lines as the building up of the computer sounds, the inside of the piano is also played. This is quite a break away from the ‘Float’ release, but it is a bleap forwards. Some truly captivating stuff on here. Another artist from Greece (usually the man behind the laptop, not the door). Those familiar with previous mecha/orga works will be surprised with this one – but not too much. Instead of his usual experimental and heavily electronic noisescapes, mecha/orga here uses only a piano and at some points some computer manipulation of the sounds. Notes and piano sounds enter the sound space discreetly, never dominating, leaving always the room presence to accomplish their not quite finished stories. At some point a heavy reverbation of some piano sound creates some tension but then again it subsides. The tension builts up with more opening piano themes but at the end nothning seems to happen – except thoughts and untold stories in a stranger’s room. But maybe that was the point. In any case, something nice to listen to. Αντιπαραθέτοντας υποχθόνιους ιντάστριαλ θορύβους και λυρικές πιανιστικές “σιωπές” ο Γιώργης Σακελλαρίου τείνει μάλλον προς τη “δοκιμή” παρά προς την εκφραστικότητα-αστάθεια, αξονική περισσότερο παρά δομική.